Jackson Falls’ two waterfalls were formed by a 2,000-foot long stretch of Mann’s Creek that flows through a hundred-foot deep ravine. Its mature hemlock woods, vernal pools and forested wetland are home to migrating birds, breeding frogs and salamanders, and rare wildflowers. The property also includes mature headwater forests, which, along with the wetlands, are vital to maintaining water quality in the Buffalo River and Niagara River watersheds. Jackson Falls was once owned by one of the last Roycrofters, Cecil Jackson, who bought the land seeking the authentic rural life that the Arts and Crafts movement romanticized. It was likely visited by Roycroft founder Elbert Hubbard, who had a cabin nearby. The revitalized Roycroft Campus is an incredible attraction in East Aurora and the protection of Jackson Falls can provide an additional destination for residents and visitors. The property was actively listed on the real estate market until the Land Conservancy signed a contract with the current owners, three grandchildren of Roycrofter Cecil Jackson, who would like to see their family’s legacy forever protected. The $300,000 grant award from the U.S. Fish and Wildlife Service Great Lakes Restoration Initiative Joint Venture Habitat Restoration and Protection program brings the Land Conservancy past the halfway point for fundraising. There are just five months left until the Oct. 31 fundraising deadline. 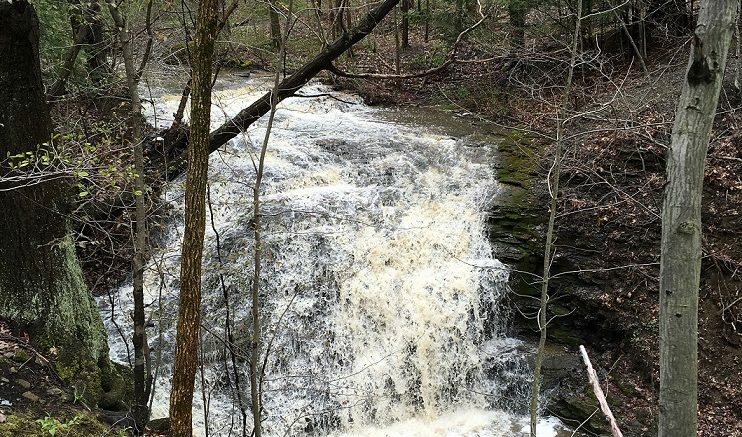 You can help the Friends of Jackson Falls and the Land Conservancy raise the $600,000 needed to create the Jackson Falls Preserve by October 2016. Donations to support this project are now being accepted by the Land Conservancy at www.wnylc.org/donate. Be the first to comment on "Land Conservancy awarded $300,000; more than halfway to goal of protecting Jackson Falls"